Six months, 2,000 miles and this rugged piece of kit is still looking good. KTM aren’t just fine purveyors of snazzy orange motorcycles, they also do funky clothing, too. This soft-shell riding jacket is part of their PowerWear range and it’s become an unexpected favourite for me, since I got in back in the spring. 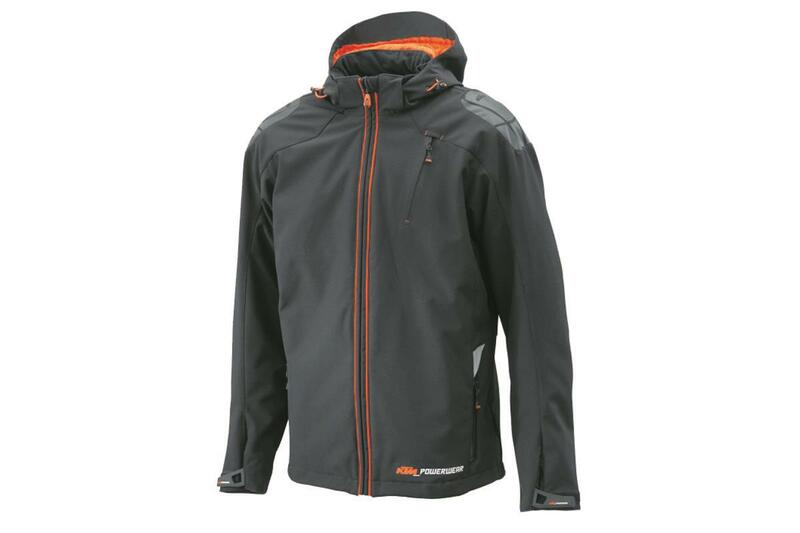 It’s light, easy and comfortable to wear, on and off the bike, warm, waterproof, windproof, comes with arm, shoulder and back armour, usefully big pockets, a removable hood and a draft-excluding high neck. It’s styling and well-fitted, too. I wear it most of the time for commuting, zipping around town and for longer jaunts on my Sinnis and my Yamaha TMAX. Don’t think for one moments this is a generic jacket with some ironed-on KTM logos, it’s a really well constructed, rugged piece of kit in its own right that looks like it’ll last a lifetime. It’s not the cheapest out there and you’re undoubtedly paying a premium for the KTM branding, but the quality is excellent.